Who is the one, eternal Word! To save those by their sins defiled. Rejoice, O saints, upon this day! Where God Himself once laid His head. 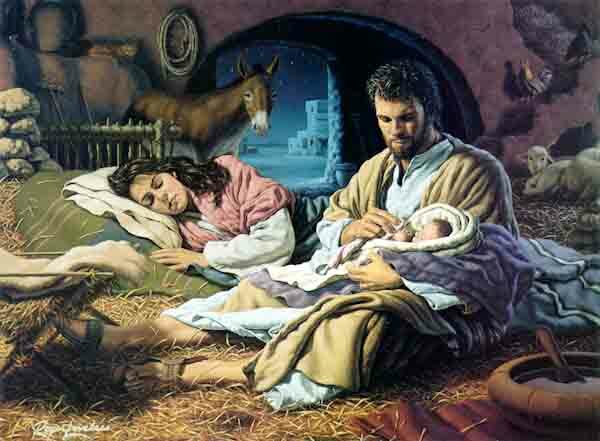 How humble was the Christ child’s bed! Rejoice, O saints, this Christmas day! Where beasts and oxen made their home. Are what God’s mother Mary chose! To keep our Lord warm while He slept. To show He’d give His dying breath! He’d die our death; He’d rise again. For Christ is our eternal friend! And so He shall fore’er and e’er! For naught can end our joyful song! Rejoice, O saints in heav’n and earth! Rejoice at our dear Savior’s birth! And join with the angelic song! To Father, Son, and Holy Ghost!